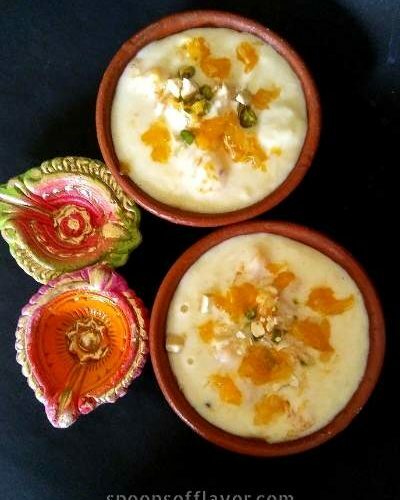 Orange Phirni/Orange flavored rice pudding is a simple, delightful dessert. A twisted version of the traditional Phirni, the popular North Indian dessert. If you crave for a milk-based creamy dessert with an exotic touch. Then this one’s for you. Traditionally phirni is served in earthen pots. That is what makes me even more excited while serving 🙂 Here I have used cashews, pistachios, and almonds. You can use any nuts of your choice or whatever available with you. The addition of saffron and orange essence accentuate the taste and flavor. Adjust the sweetness by adding more or less sugar as per your taste buds. Make this indulgent dessert by following the simple steps below and relish with your loved ones. Let me know your thoughts about this orange phirni in the comment section. Also, you can connect with me on Instagram, Facebook, Pinterest, and Twitter. 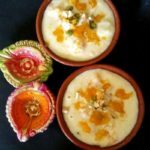 Orange Phirni/Orange flavored rice pudding is a simple, delightful dessert. A twisted version of the traditional Phirni, the popular North Indian dessert. Soak the basmati rice in water for 2 hours. Once done drain them completely. Then ground them to a fine paste and set aside. Heat milk in a shallow bottomed pan or non-stick pan and allow it to boil. Take 2-3 tbsp milk in a bowl and soak the saffron strands in milk. Then set aside for later use. Add basmati rice paste and stir to mix. Let them cook by stirring continuously over low to medium flame until thick and creamy. It is important to make sure the milk doesn’t stick to the bottom. Once done add sugar, cardamom powder, and saffron infused milk. Now stir continuously and cook it for 2 minutes more or until you get the desired consistency and turn off the flame. Powder the cardamoms in a mortar-pestle and discard the peels. Allow the rice pudding to completely cools down. Then add freshly squeezed orange juice, orange essence, and chopped nuts. Mix well. 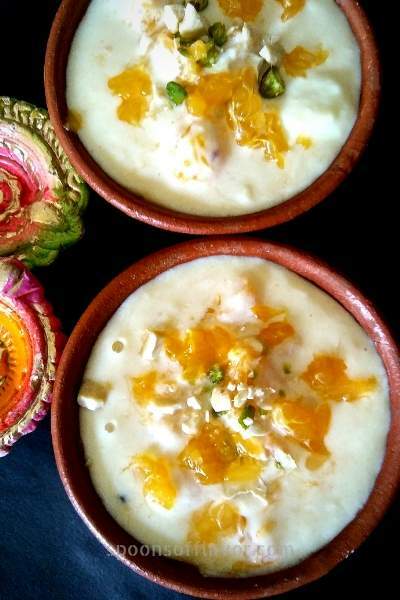 Serve this orange flavored phirni chilled in earthen pots after garnishing with chopped nuts and orange chunks. Grind the basmati rice well. To make the process faster and easier, use a flat bottomed wide pan or a non stick pan would be best. Make sure the milk does not stick to the bottom. Hence stirring continuously is must. Add the orange juice and orange essence once the phirni completely cools down.